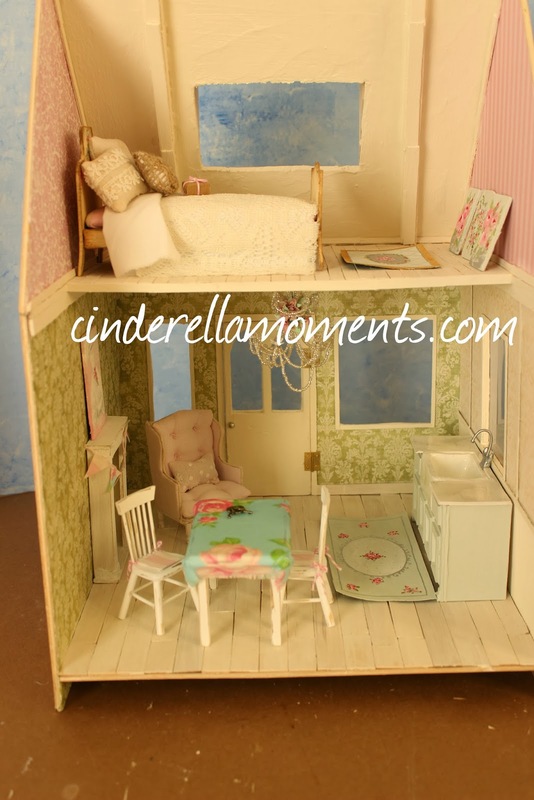 Cinderella Moments: Jen's Cottage- Pink! I have been working on Jen's Cottage. This house is cut out of a sheet of wood from the hardware store. It's an original design. I sketched the house down on my notebook about month ago. It's gone through some little changes, like the addition of a wrap around porch. I've done the porch floor. 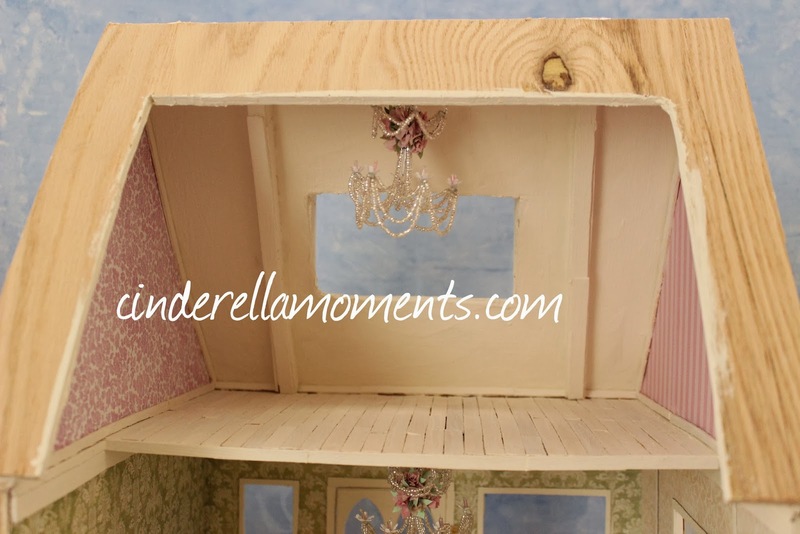 The roof will probably be put on after I paint. I've painted 2 rugs and some artwork for the interior. I also finished some pillows for the bed. The roof is on and the upstairs chandelier in place. The siding is on the exterior. Now it's time to paint. Finally, a pink house! Thanks Jen for going for it! This is going to be the sweetest house I've ever made. Мне нравится розовый цвет. С нетерпением буду ждать завершение проекта. А кто там будет жить? Принцесса? 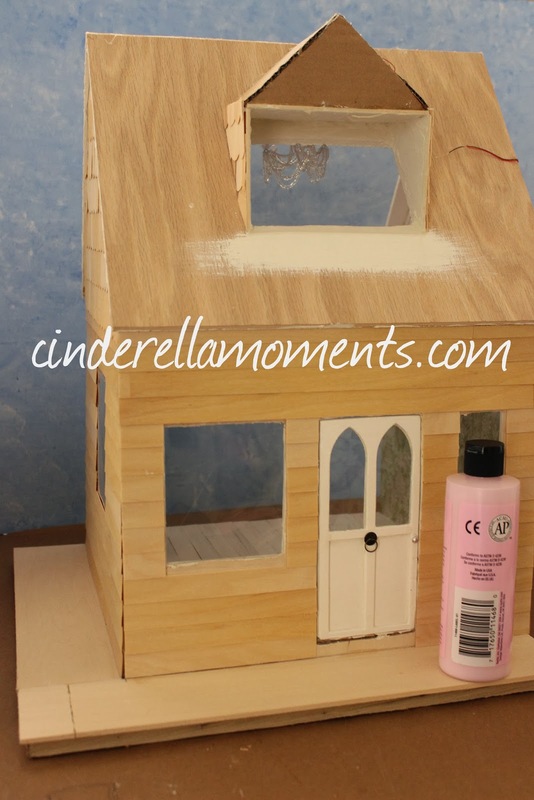 Looks like the beginning of another adorable dollhouse. do with it. It will be fabulous as always, I am sure! Your a sweetie, and I appreciate you so much. Nice design and size Caroline. I look forward to seeing how you finish it and what you do with the porch area. Hola Caroline, primero quiero desearte feliz año y darte las gracias por tus amables comentarios. Siempre estoy deseando ver tus nuevos proyectos porque me gustan todas tus casas y esta en rosa es muy bonita. I love the colors you used, and the painted rug looks beautiful. 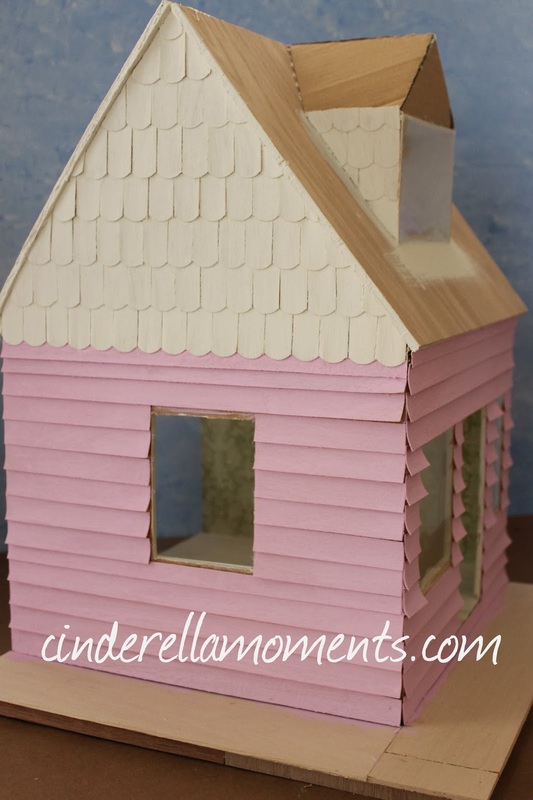 Such a cute little house and I love that pink! Looking forward to seeing it all done! Wow you work fast. Weren't you just on vacation at the beach? *smile: Well, I think it will be the best too! Wow what a pretty little house! Small and compact. It already looks sweet and comfy! It's already wonderful sweet, so girly. I will love to se more. Dear Caroline, I just love the house, it is sooo pretty in pink! 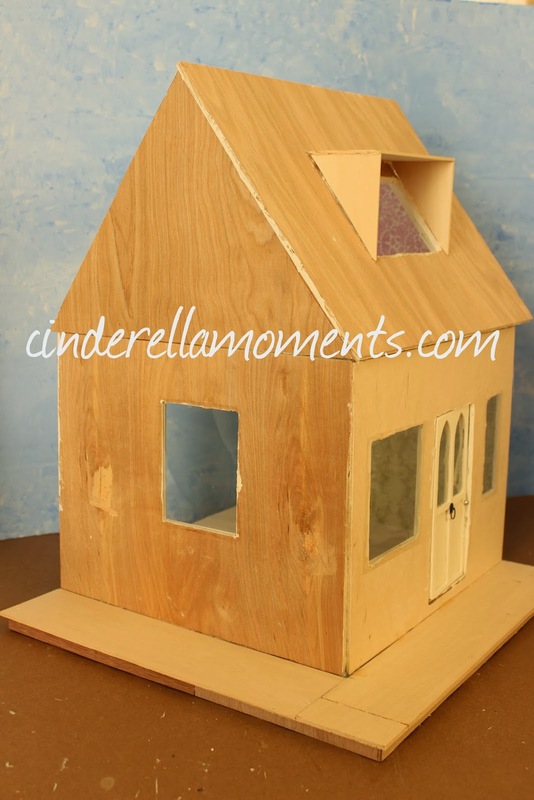 Since this is not from a kit, but made from scratch, could you explain how the construction of the house is made? Is it enough only to glue them together? This is sooo cute, I love it! Hi Ebru! I just get a sheet of thin plywood from the hardware store. I cut out my design. 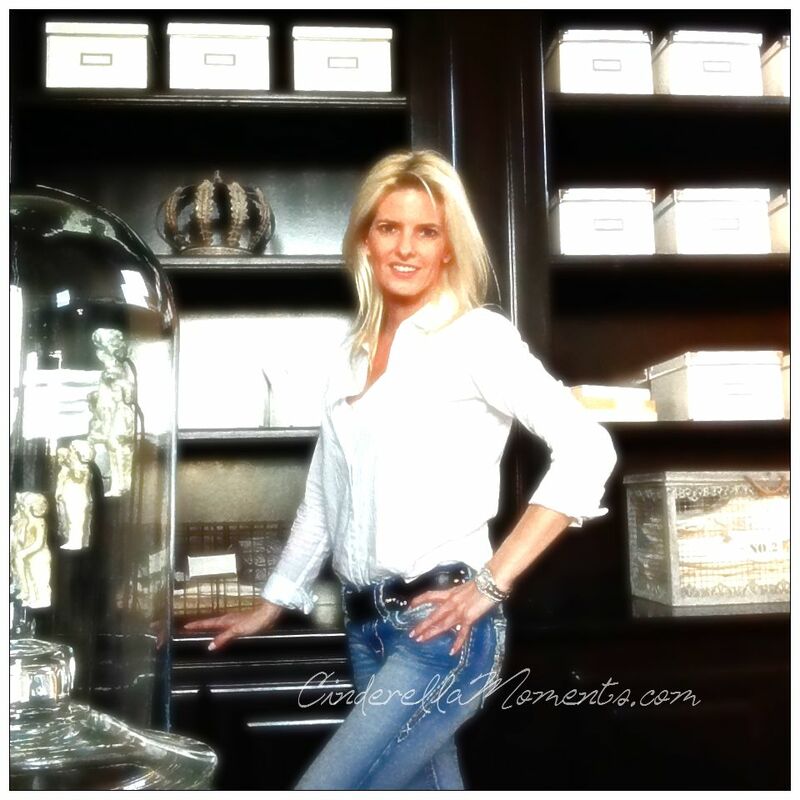 This one needed to be taller so I could have a nice space for the bedroom. I cut out the windows and doors. Then I do hot glue it. The thing is that my hot glue is for wood and I use the hotter professional hot glue gun. We made a mistake on a previous house and tried to pull it apart. It was impossible. This stuff really sticks! If your glue is not quite as strong you can use a staple gun for such thin plywood. If I use MDF I nail it together. But usually hot glue is enough. Especially if you are not shipping your houses. Try out gluing a couple of pieces of leftover wood together to test out your hot glue gun's performance. Great question Ebru! And from scratch too! That is amazing. I love every bit! I will be back to watch how she comes along. This is going to be a very sweet house! I just found your blog through Pinterest! Cute idea!! Me encanta tu nueva casa y estoy deseando ver más avances.